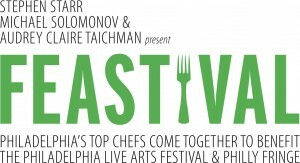 Top Philadelphia restaurateurs Stephen Starr, Audrey Claire Taichman, and chef Michael Solomonov are teaming up this fall for Feastival, a culinary event benefiting the Live Arts Festival and Philly Fringe. The tasting feast will take place on Wednesday, September 15 from 6:00 p.m. to 9:00 p.m. at the Festival Hub on Fifth and Fairmount Streets. In the urban garden-themed space, chefs like Jose Garces, Georges Perrier, Ellen Yin, and Marc Vetri will offer bites from their restaurants. The event will also feature signature cocktails from drinking establishments like the Franklin Mortgage & Investment Co. and Noble: An American Cookery. Besides the nibbles and booze, there will be silent and live auctions, Live Arts performances, and a drive-in movie theater outside the Hub that will play footage from 13 years of festival performances. Tickets and the full list of participants are available on the Feastival website. All proceeds benefit the Philadelphia Live Arts Festival and Philly Fringe.